Friday night. I checked the weather for any possible showers. The forecast during sunrise was clearing skies. It's a good timing to see clouds and hopefully, the sun can peep out. I packed up my gears that night and went to bed early. 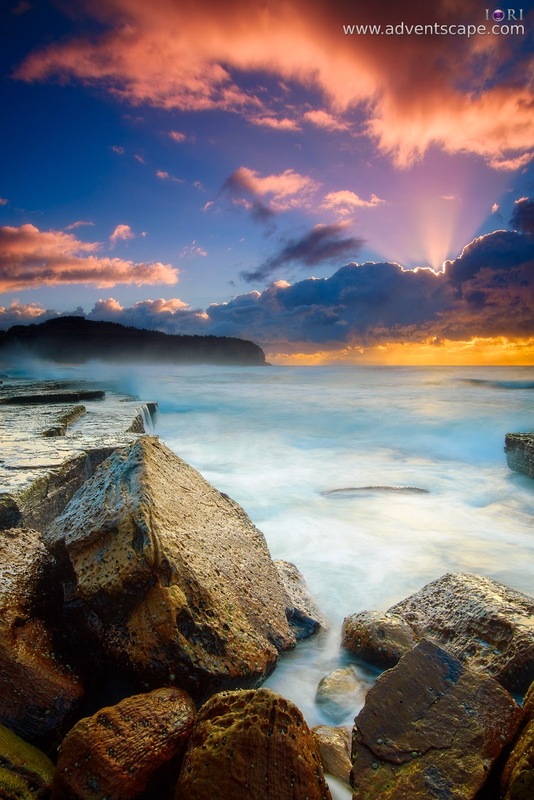 When I arrived at the area, I decided to take photos at Narrabeen Rock Pool. I frequent Turimetta beach, so it's time to take photos of other locations. As I was taking photos at the rock pool, I kept on walking. I walked beyond the pool, to the reflection, to Narrabeen Pool Cauldron. I ended up standing at one end of Turimetta beach again. I don't know. I can't believe it... I'm drawn again to this place. To add to this weird situation, the clouds don't seem to move away from the horizon. This is bad as the sun could rise any minute. If the clouds are close to the horizon, the golden glow might be suppressed. By the time the sun is up beyond the clouds, it's already white light. I was right, sunrise happened with the thick cloud blocking it. A strange thing happened. The clouds are lifting bit by bit as though it purposely blocks the sun. Please refer to the photo. I can see how beautiful the colors are. I'm happy with the light trail too! The color difference at the sky are what draws my attention. The composition is fairly straightforward as well. I used a 4 stop Neutral Density filter. I also use a 3 stop Singh Ray Reverse ND filter. With both filters on, I can make the waters fluffy and even out the exposure with the sky. In Photoshop, I just did the usual noise reduction, sharpening and curves. What I was surprised is that, the colors pop out after I increase saturation. The original photo looks flat. But when I add a hue and saturation adjustment layer, it became colorful!